Roomba vacuums are growing in popularity because they can actually reduce your overall workload. But not everyone wants an actual Roomba or knows whether they’re a good option or not. You’ll want to take a good look at the iRobot Roomba Models Comparison we have here and our overall Roomba buying guide. That way you’ll be able to choose the best option for your specific situation and your needs. 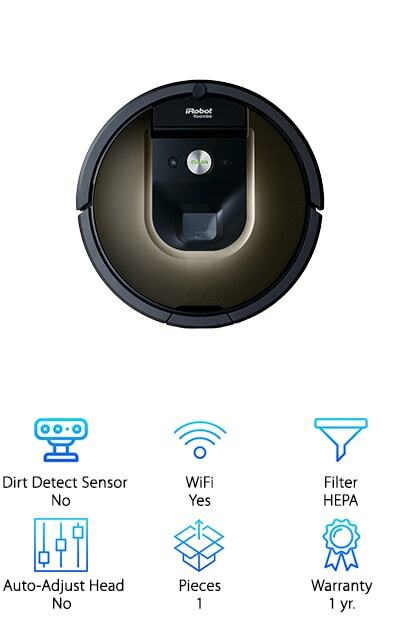 Dirt Detect Sensor: Not every Roomba offers dirt detection but the ones that do are able to actually find dirt and take care of it more quickly than others. This type of detection will make your (or the Roomba’s) job easier. WiFi: If the Roomba you have is able to connect to the WiFi in your home it’s going to open up even more possibilities. You’ll also be able to control it more simply and make sure that it’s working even longer. Filter: A vacuum with a filter means that you’ll be able to get rid of even more dust and debris. That way you can improve the air quality for those with asthma or any type of allergies. Auto-Adjust Head: Some Roomba vacuums will automatically adjust the head so that you can accomplish even more cleaning. If you have to do this it lowers the versatility of the vacuum but it might lower the price. Pieces: You want to know how many pieces are included when it comes to your vacuum cleaner. The more pieces the more features. Look at this statistic to see how many attachments come with your vacuum. Warranty: Having a warranty means that your Roomba is going to last even longer and if it doesn’t you’re going to have no problem getting it repaired or replaced to take care of the problem. How long the warranty is will be important. If you’re looking for a way to clean up your house without having to do all the work yourself a Roomba is a great option. These handy little vacuums actually do the work for you and that’s why we’re going to do a little Roomba model comparison. You’ll see several different options and Roomba reviews here so you can decide which one is the best choice for your home. The iRobot 980 is our top pick because when it compare Roomba models it actually has a range of different features to go along with it. It has 2 different virtual wall barrier modes, to make sure it doesn’t go anywhere you don’t want it to and even has extra side brushes and high efficiency filters. Able to be controlled by your home assistant, you can also set up your cleaning preferences or schedules directly from your smartphone. On top of that, you get a specialty cleaning system that gives more air power on carpets and rugs. The navigation system uses visual localization to make sure it can clean and navigate through an entire floor and it automatically recharges itself when needed and then gets back to cleaning. When you need to clean it there are tangle-free extractors that make sure nothing jams and you can even look at maps to see what’s been cleaned and where. It might just be the best Roomba for sale. The iRobot 690 is our budget pick because it offers you several great features at a price that most can afford and the difference between Roombas is small. It has the standard iRobot app which lets you schedule when and where to clean. It also has a 3 stage cleaning system and multi-surface bristles that get smaller pieces as well as larger debris. The dirt detection sensors make sure that it concentrates even more effort into areas that are dirtier than others and the intelligent sensors make sure that it can get around and under your furniture. 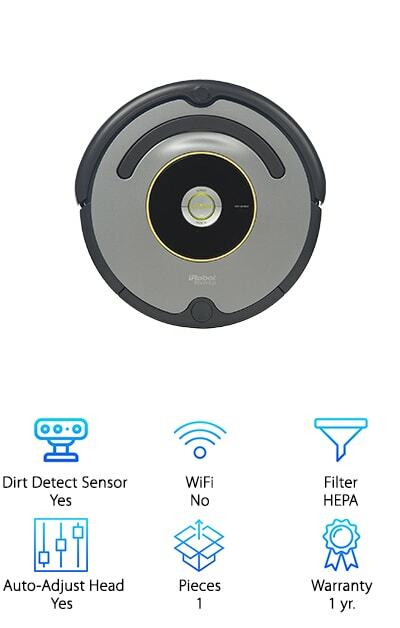 There is even an auto adjust cleaning head that can change its own height to work for carpets or hard floors and a dual mode virtual wall barrier to stop it anywhere you want. You’ll get a flat cleaning tool and an extra filter as well as an edge sweeping brush that can get into edges and corners of your room. You can compare iRobot Roomba models all day but the iRobot 960 Vacuum is a great choice. It can be used with some apps to let you control when and how it cleans. It’s even able to clean an entire level of your home because of the visual localization in the navigation system and the cliff detect sensors that keep it from falling off of drops or stairs. It’s able to run for up to 75 minutes on a single charge and can then automatically charge itself and continue cleaning until it has finished the job. That way it never stops working for you and your home. With the AeroForce Cleaning System it’s able to use up to 5x the air power to get pet hair and other debris without tangling. Included with the system is a dual mode virtual wall barrier, which keeps the device out of areas that you don’t want it and a side brush that helps it get into corners and edges. The iRobot 614 is designed to be super simple because you don’t even need an app in order to use it. There’s a Clean button right on the top that you can press and you don’t need to program anything. The 3 stage cleaning process, as well as the multi-surface brushes, are able to pick up small and large particles and the dirt detect sensors mean that it will work hard to get extra-dirty areas even cleaner. It also has a system of intelligent sensors that help it get around and under your furniture to get every part of your floors. When it travels between hard surfaces and carpets it’s able to adjust its own height to get a good clean and it comes with an extra filter and edge-sweeping brush that can clean corners and edges. When it runs low on power it will automatically return to the base so that it can charge and be ready for next time. That’s one of the Roomba differences from other types of vacuums. The iRobot 630 has special navigation features that enable it to navigate around your home with ease, even when you move things around. It’s also complete with a 3 stage cleaning system that allows it to brush and even suction different parts of your floors. When it runs over different floor types it automatically adjusts to the height of the floor and when it runs out of power it even docks and recharges itself so that it’s ready to go when you need it next. Plus it is automatically responsive and cleans areas throughout your house more than one time, including corners and under furniture. All you need to do to get it going is push the button on top and it will get started just like that. There’s no need for an app or any kind of programming. Instead, it even offers dirt detection to locate any dirt on the floor and get even better cleaning and maybe. 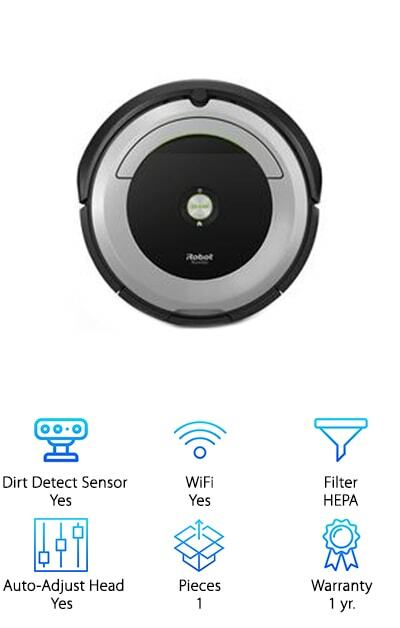 The iRobot 890 connects to the Home App and lets you clean anything you want as well as scheduling cleaning or setting up your own preferences directly from your smartphone. It also connects to your home assistant devices. When it’s cleaning it uses an AeroForce cleaning system that helps increase air flow so that it can pull even stubborn debris out of your carpets and off your floors. More than that, it has a high efficiency vacuum that’s nearly maintenance free. When it comes to cleaning corners it has a side brush that can take care of it for you, getting deep into edges. When it comes to navigating around the room this vacuum has adaptive technology that finds its way around anything, covering each section of the floor multiple times to make sure that it’s completely clean. 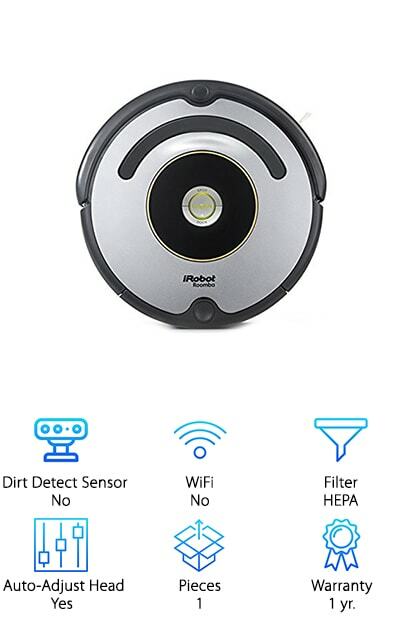 It also has a special battery that gets even more cycling before it needs to be changed and when you look at iRobot comparison that’s a great benefit. The iRobot 618 requires you to simply push the button and it’s ready to go, without needing any help with programming or anything else. It has a 3 stage cleaning system that can get rid of everything from dust and debris to pet hair and even cereal, plus it has an extended life battery that gets up to 4x the cycle lifetime. When it gets to different surfaces it has an auto-adjust head that can change the height to make sure it gets deep into carpeting but doesn’t hurt your hard surface floors, which is something to look at in your iRobot Roomba comparison. There’s an edge sweeping brush that gets debris from corners and edges as well as sensors that make sure it gets under and around your furniture but doesn’t hit them. There are also cliff detect sensors that let it know where edges are so it doesn’t drop or fall. When the battery gets low it automatically docks so it’s ready to go when you need it. The iRobot 860 is a simple design that lets you clean your home quickly and easily without programming. You just push the button on the top of the robot and it gets started. Of course, you can program it to clean up to 7 times per week if you like and it will take care of getting your home ready for anything. It also has a 3 stage cleaning system that makes sure all of the dirt and debris is removed from different floor types including hard surfaces and carpeting. The navigation system even takes care of getting around and under your furniture to get a more thorough clean. If you look at the Roomba 860 vs. 805 you’ll see a lot of similarities between the two. There are tangle-free extractors that make sure hair and other debris don’t clog the system and the lithium ion battery can get you up to 2 times the battery life. It can easily fit under the average bed or furniture and can deliver up to 5 times its average air power to get difficult debris out. If you compare iRobot models you’ll see they’re actually very similar in many ways. 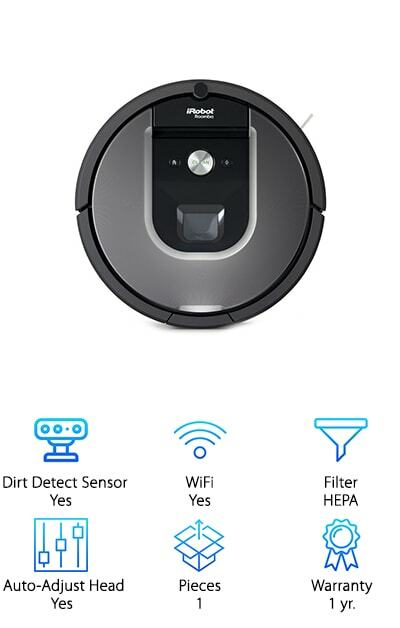 If you’re trying to figure out which Roomba to buy, the iRobot 650 gives you the navigation system that helps to get under and around your furniture as well as the 3 stage cleaning system. It can also be started by simply pushing the button on top or you can schedule it for up to 7 times per week. When it’s running low on battery it automatically seeks out the charging station and docks itself so that it’s recharged and ready to go when you want to use it the next time. It’s short enough to fit under most furniture and it can adjust automatically to different floor types. It comes with 1 virtual wall barrier so you can stop it from entering places you don’t want it and an extra filter so that it’s ready to go even longer. The dirt detection is also able to find even dirtier sections of the floor and target these for advanced cleaning. Plus it can get edges and corners with the edge sweeping brush. Check out our iRobot Roomba 805 review. It offers a high efficiency filter and 2 different cleaning options. You can either push the button on top of the unit when you’re ready to go or you can schedule it to clean up to 7 times per week. 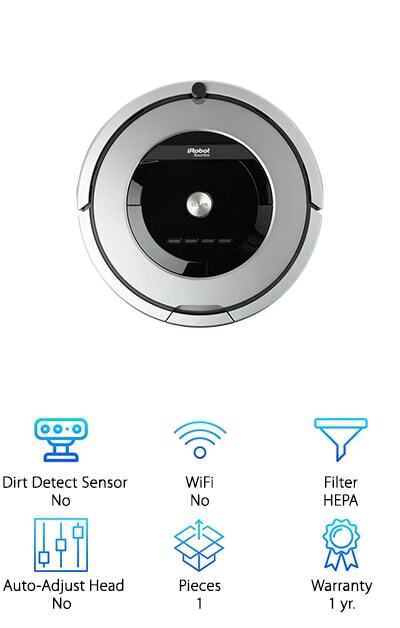 It’s able to automatically adjust to different floor types including hard surfaces and carpeting, plus it has 2 virtual wall barriers that can keep it contained where you want which gives you an edge on the Roomba 805 vs. 650. On top of that, it’s able to dock itself and recharge so it’s ready to go for the next scheduled cleaning day. The navigation system allows it to know where to go and how to avoid drops as well as where to avoid furniture but still get under it for a more thorough clean. On top of that, it can deliver a large amount of air power to clean stubborn areas and it makes sure your home is cleaner than ever.